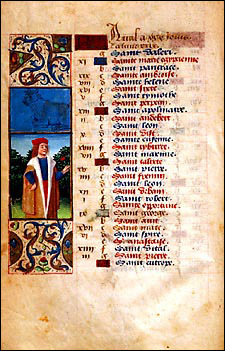 The two-column KALENDAR of this Missal has in its first column the most inclusive and most widely used Kalendar in the world. 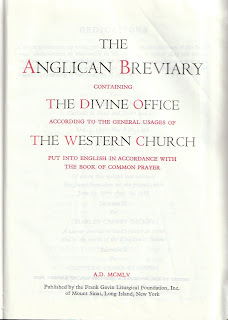 In this has been inserted in brackets a few Feasts which are of general interest to Anglicans. Feasts which are considered of less interest are printed in Italics and their Propers are given, not in THE PROPER OF THE SAINTS, but in THE SUPPLEMENT. Thus the former, which consists only of those Feasts which the editors felt they could recommend for wide-spread usage, furnish a conservative but devout Kalendar observance, and the latter can be used where, and when, and to the extent that, it is found useful or necessary. For that matter, in very few localities is the so-called Universal Kalendar followed exactly. Rather it is used as the basis of local Kalendars, Feasts being transferred or even suppressed, according to prescribed rules, in order to provide for local liturgical needs. In other words, the Universal Kalendar is used as a norm on which to base local Kalendars (The People’s Anglican Missal, p. ii – iii). The chief problem of any Breviary is the Kalendar. Inasmuch as the Prayer-Book is based on a greatly simplified Kalendar, Anglican tradition may be said to favour those conservative Uses of the Breviary (such as the Monastic) which do not follow the so-called Universal Kalendar in its entirety. This latter is most inclusive, and therefore the most complicated Kalendar of any liturgical usage today. For which reason a committee of priests has drawn up a simplified Kalendar for Anglican use, to follow which in this Breviary, one should keep only those Feasts which are marked with a star ( * ), and should begin at beginning of the Proper of the Saints with the Mark SK and disregard everything marked UK (Anglican Breviary, p. E1). The Universal Kalendar and the Simple Kalendar can both be profitably used by Catholic Anglicans. On this Blog I provide Ordo Notes based on the Simple Kalendar and I also consult the Sarum Calendar published by Dr. William Renwick. There may therefore be occasions where I will deviate from what might be expected based on the AB’s Simple Kalendar alone.